This flight was due to depart shortly before midnight and as I had checked out of my accommodation in the morning, I took advantage of Hong Kong Airport Express Trains in town check-in service. This gets you checked into your flight, given your boarding pass and luggage sent to your flight right from the train station. 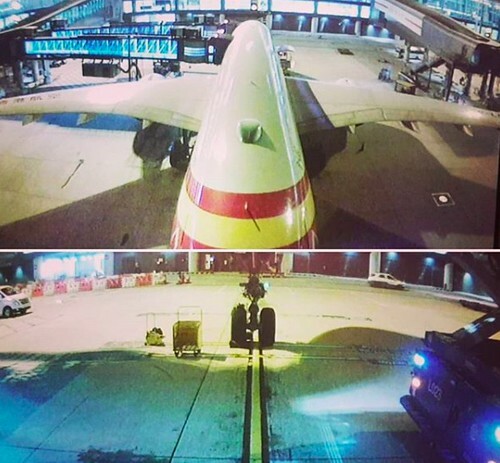 You can access this 24 hours before your flight and up to 90 minutes before departure. 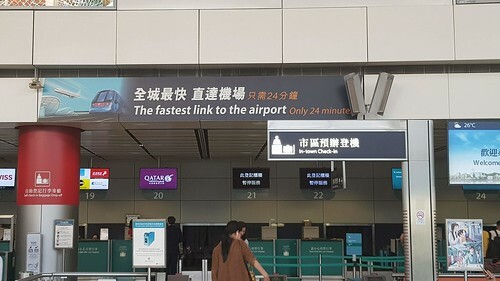 Now this service is available at Kowloon & Hong Kong station – the best part of this service is that it is free when catching the train to the airport. Similar purchase your Airport Express Ticket or touch your Octopus card to enter the check-in area. The Hong Kong Airlines staff were really great at the in-town check in. Confirmed my flight number, departure time, departure gate and provided me with a voucher to access their lounge Club Autus located in the mid-field concourse. Club Autus is Hong Kong Airlines flagship lounge at HKIA. The lounge is located within the mid-field concourse which requires using the underground people mover after clearing security and immigration screening points to get to the gates and lounge. The lounge is well appointed with dining areas, business centre and private rest areas. They have a good selection of beer, wine, cocktails and spirits available as well as non-alcoholic options. The food selections are plentiful with both a buffet and made to order food options. After a long day exploring Hong Kong, I was in need of a shower. This was for my own benefit and my fellow passengers on this A350. The staff provided with a buzzer that was to notify me when a shower was available. Upon being notified of it availability I headed to the facility – the shower I was given was the accessibility and parents room shower. Not the best shower facility at this lounge however still did the job. No boarding announcements are made in the lounge as to not disturb guests trying to sleep. I headed down to the gate ready for departure where there was a priority lane (Business Class and top tier frequent flyers) and general boarding lanes. As soon as the clock ticked over to the time for boarding that was printed on the boarding pass the glass doors to the aero bridge were opened and both lines were scanned onto the plane. This took away from the priority of the priority lane. The Business Class cabin is in a 1-2-1 configuration giving all passengers direct aisle access. As one who loves a window seat, this configuration means that not all window seats are created equally. To ensure you get a true window seat with privacy you need to select an even number seat. Upon getting to my seat I was welcomed by a member of the crew and invited to choose a pre-departure beverage. We were promptly pushed back on time and headed to depart via Runway 07R banking left toward Bangkok. As this was only a short flight, food was served as soon as we reached our cruising altitude. Firstly, another drink and warm nuts were served, followed by a selection of fresh fruit. On this flight a choice of either Seafood Cannelloni or beef tenderloin cubes was available. I went with the Cannelloni, as can be seen below. Dessert was blueberry cheese cake. This was actually my first trip onboard an A350 and I was impressed with the overall impression of openness in the cabin. I loved the large windows and the quietness of the cabin is noticeable compared to other older wide bodies. The Business Class cabin feature a lie-flat bed with plenty of little storage areas to keep all your belongings during the flight. The IFE had a good selection of movie and TV choices along with an interactive moving map. One thing I absolutely loved was the landing gear and tail cameras. This was just shy of 3 hours – meaning enough time to be stuffed with food watch a movie then land. Prior to landing immigration forms and express passes were handed out. These express passes were greatly appreciated when I arrived an saw the standard queue to be processed. Overall, I was impressed with the quality of service provided by Hong Kong Airlines as a Business Class passenger. The service was not as polished as say Cathay Pacific however was really good and I would fly them again. On this particular route you have plenty of options including Emirates, Thai and even Royal Jordanian – this is a particularly competitive route meaning fares in the premium cabins are competitive. Thank you for writing! 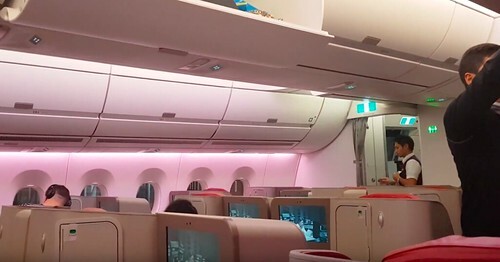 Such an amazing experience you had on board the Hong Kong Airlines A350. Thanks evangrady64 - It was a great flight and one I hope to take again soon.